Cars quickly strung out single file as normalcy returned to Sonoma. Rossi dropped to the rear after his faux pas, but gamely battled back storming his way through the field and whipping one car after another. On lap 44 Graham Rahal’s car suffered a battery issue, sitting dead stick on course and bringing out the afternoon’s only caution. His stable mate Takuma Sato was already out by the time Rahal eventually returned to the fray, capping off a season in which he was beaten up pretty badly. Exciting racing unexpectedly broke out following the lap 49 restart, almost as if an oval race were magically dropped on to the dreadful road course. Cars locked ’em up as others bumped and grinded their way through the turns. Carlos Munoz was contacted by Matt Leist – who was penalized – and spun out while fellow Andretti Autosport driver Rossi continued his hard charge toward the front. Seductive Ed Carpenter Racing rookie Jordan King gained the most positions, improving twelve spots on the day as well as his chances of returning next season. The rookie quickly got the rough Rossi treatment after the restart however, as the Indy 500 winner passed him low through a corner. Rossi wasn’t finished, bump passing Josef Newgarden and then getting around James Hinchcliffe in quick successsion. King followed in his wake as the close racing continued for several laps before everyone again calmed down into single file more typical of Sonoma’s unpleasurable environs. 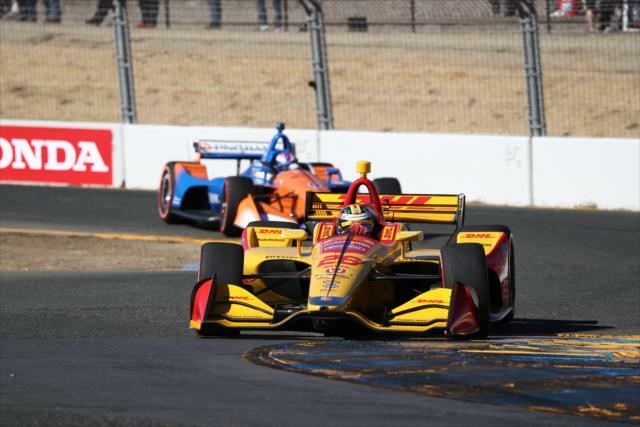 Hunter-Reay cruised to victory leading all but five laps, although the spotlight was firmly on Dixon and Rossi, who faded after his war-like tear through the field to finish seventh. Dixie wound up second ahead of the sadistic Will Power, whose presence on the podium added insult to injury for fans. 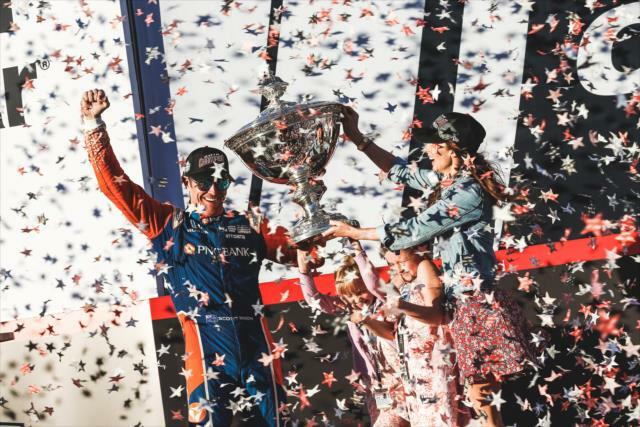 This entry was posted in Alexander Rossi, Andretti Autosport, Carlos Munoz, Ed Carpenter, Graham Rahal, IndyCar racing, James Hinchcliffe, Jordan King, Josef Newgarden, Marco Andretti, Matheus Leist, NASCAR, NBCSN, Ryan Hunter-Reay, Scott Dixon, Sonoma Raceway, Takuma Sato, Will Power and tagged 2018 season, IndyCar, IndyCar Grand Prix, IRR, irreverent humor, season finale, Sonoma Raceway by IndyRaceReviewer. Bookmark the permalink.